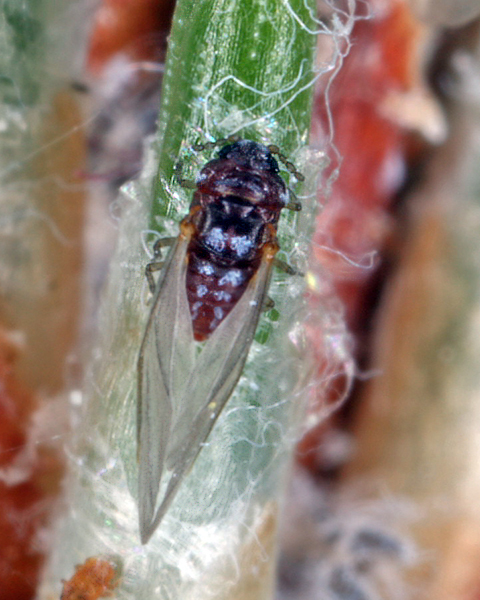 Pineus aphids are distinguished by having only four distinct pairs of abdominal spiracles. Wingless adults on secondary hosts are pear-shaped or globular and have a fused and pigmented head and prothoracic shield. 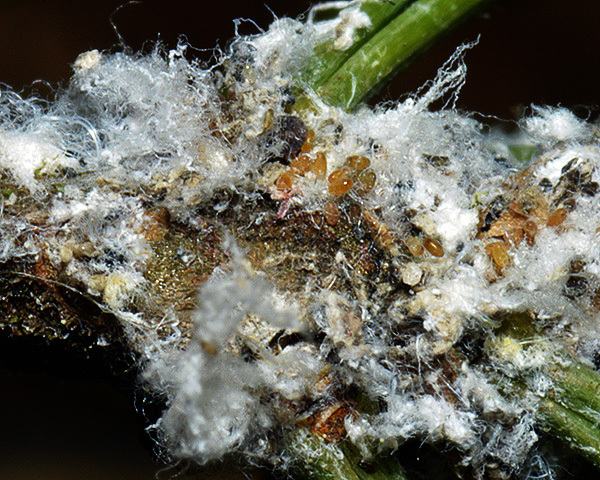 They generally secrete white wax-wool. There are about 23 Pineus species through Europe, Asia and North America. The primary host of species with a sexual stage in their life cycle species is spruce (Picea), and the secondary host is pine (Pinus). 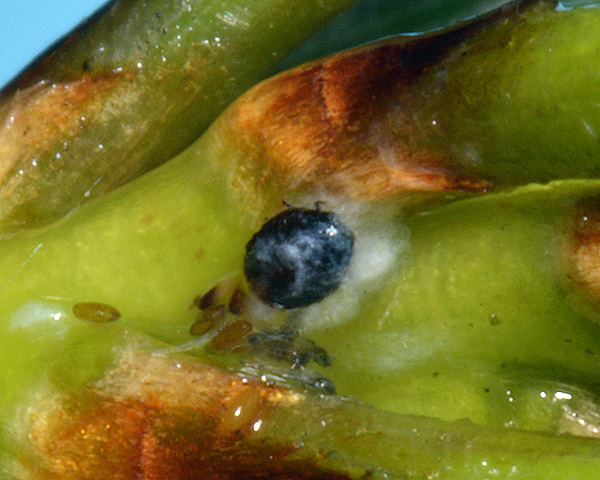 The galls on spruce are usually on the shoot tips and are less compact than those of Adelges. 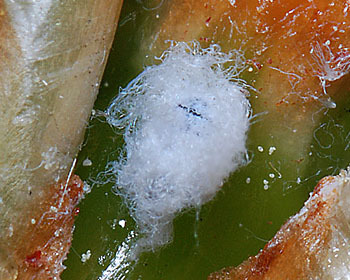 Several Pineus species have lost sexual reproduction and host alternation, and instead live all year on spruce or pine. In life the apterous female of Pineus pini, known as the 'sistens' (see first picture below), is covered in white wax wool. Under the wax the sistens (see second picture below) is dark brown to dark redand almost spherical. The head and prothorax are heavily chitinized. The antennae are 3-segmented. There are small, separated wax gland facets on the head-prothoracic shield (cf. Pineus strobi and Pineus pineoides which have wax gland facets with polygonal lumina). The meso- and meta-thoracic plates are chitinized and fuse to form transverse segmental bars. The abdomen has four distinct pairs of spiracles and an ovipositor. 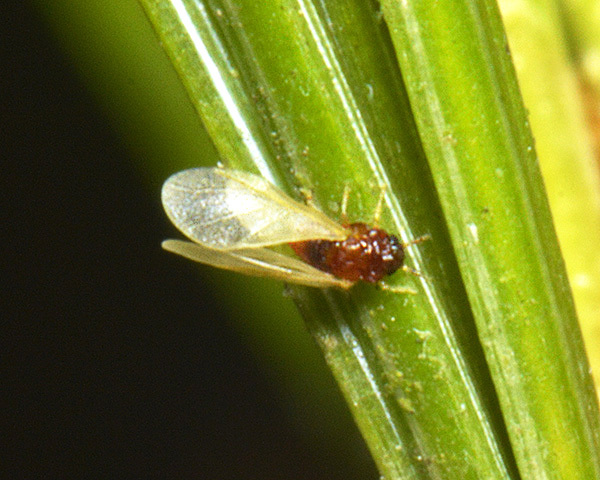 The adult aptera has a body length of 1.0-1.2 mm and a width of 0.8-1.0 mm.